After a once-in-a-decade-or-more dry spell for 2/3rds of Alaska the weather machine in evening the score. Here in Haines we enjoyed 12 straight days with no precipitation and some record warm afternoons (and, yes we did get the hay cut, dried and into the barn, but it did take 5 days to dry. See the hay-cutting-weather post). 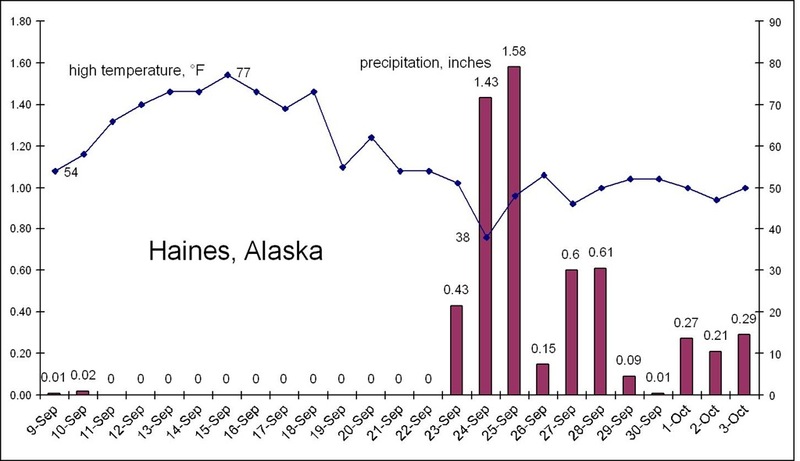 This was the general case for all of normally-wet Southeast, Southcentral (Anchorage’s drought was broken a up by several days of “trace” amounts of precipitation—if you ignore those they had a 19-day rainless period), and right on into the interior where Fairbanks had 21 consecutive dry days (no traces even). Of course Anchorage is normally quite a bit drier than Southeast, and the interior drier yet. 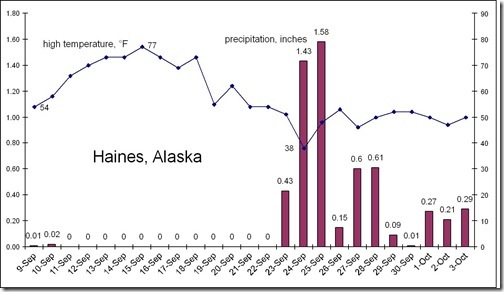 So compared to climatology, the September 2010 dry spell award should go to Yakutat, where the average September doesn’t see more than 8 dry days, consecutive or not. This year there were 14 in a row (by the way, that was it, 14 dry days total!). REDUCED VISIBILITY IN MANY PLACES DUE TO BLOWING DUST. 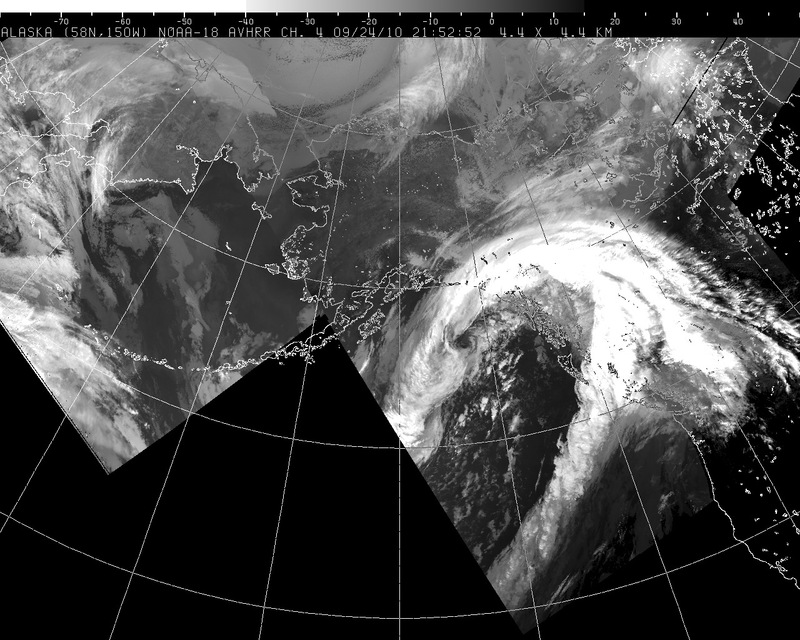 Since this first storm broke down the gates, there has been a new assault every few days, and most coastal areas are about to surpass the dry spell with an equal or longer wet spell. In actuality, this is much more typical than the dry spell. The main thing that stands out now is that the strength of many of these lows is quite impressive for early October. Does this progression mean anything? Will it continue? Beyond the 5-10 days (variable) of useful forecasts from the computer models (which right now are calling for a continuation of the current storm cycle), we enter into the realm of general, broad brush forecasts of whether it will be wetter or direr than normal, warmer or cooler etc. averaged over a time period. There is not much to go on, but making some statistical associations with longer-term climate and oceans cycles (such as El Nino and La Nina among others) may have some validity and possible usefulness in predicting what kind of winter we might have, for instance. Am I bold enough make that kind of forecast? Check back around the middle of this month to find out.